It's February, the world is covered in a blanket of snow. Even the hardiest herbs are frozen back, the dandelions are frosted over. In short, there is not much fresh food to be had for the locavore! There is, however, the last stocks of keeping food - potatoes, beets, cabbage, and apples. As the weeks go by I occasionally must pick thru our bags of apples from the Farm Share and pull out any with squishy spots. As the old adage goes, you can't let them sit there or the whole thing goes off. Fortunately, they are not beyond help. Removing the mushy bit is simple enough and the rest of the apple is sweet as ever, if less than crisp. Stewed apples are the trick. Or, if you wanna get fancy call it a compote. The same plan works for rehydrating dried fruits as well! First, some seasoning to jazz it up. I made a bag of whole spices - cardamom, cloves, allspice, cinnamon, and star anise. 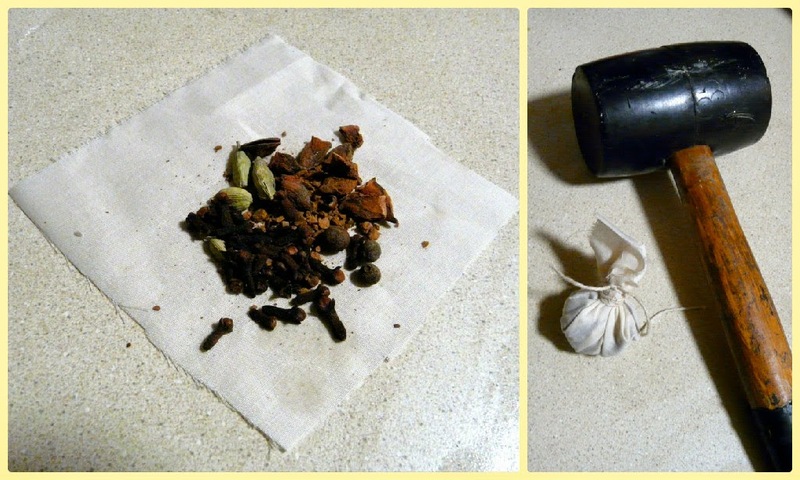 Then, to release the goodness of the spices, wrap up your bag tightly, and WHACK IT WITH A HAMMER! Ok, don't do it too violently, you don't want bits of spice flying across the kitchen, just tap it lightly until you smell the spices. Add it to your pot of apple bits, along with a bit of sugar (not too much, these apples are plenty sweet on their own) and some liquid. I chose white wine. Because .1) it's really tasty with apples. 2.) 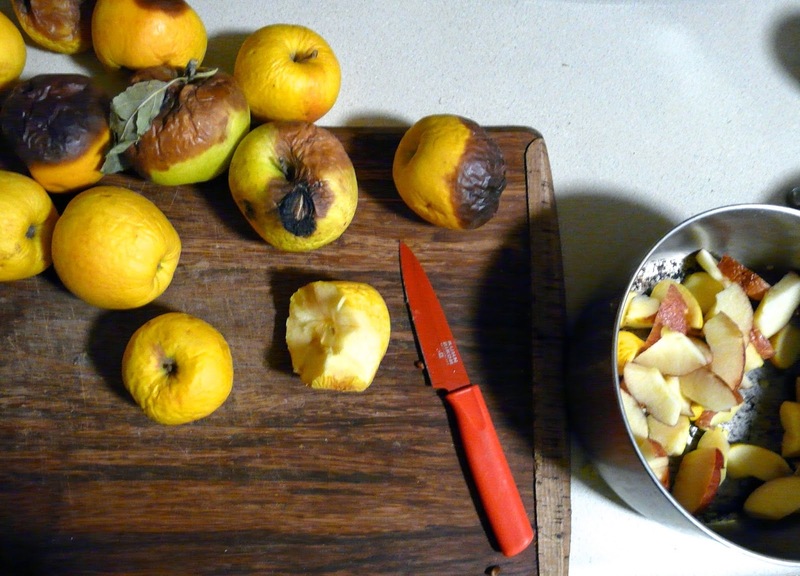 it adds dryness to the stewed apples. 3.) I can have a glass while I cook. 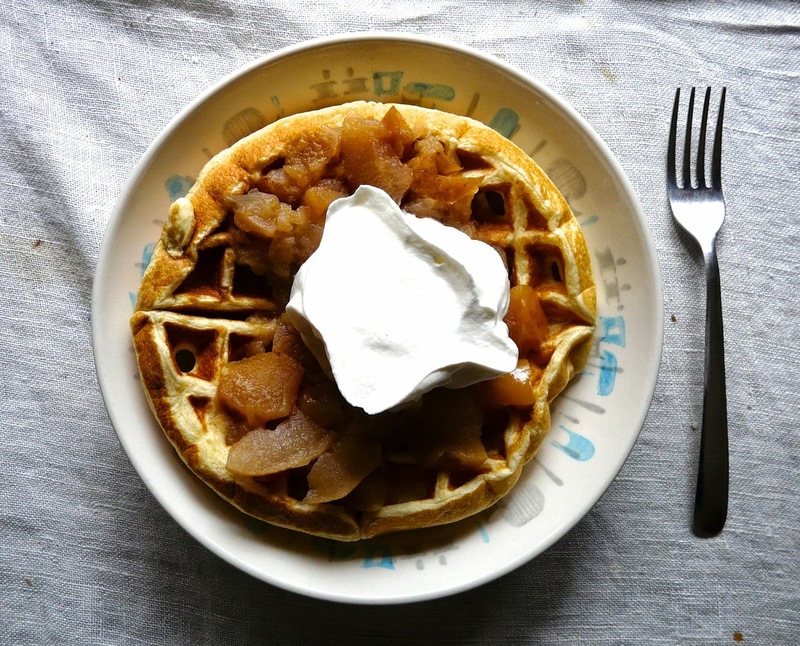 I let the whole shebang cook on the lowest heat over night, then greeted a cold winter morning with waffles, apples, and whipped cream. And maybe some more wine. PROST! Painting - What I did on my January Vacation.